Over the last few weeks I've been studying the statistics of the Cathedral at Santiago de Compostela to see what they say about when people walk, where they come from and where they start. I've taken the vast data and dispensed it into spreadsheets and then put the results together in graphs to see what they say. Some interesting stuff here! 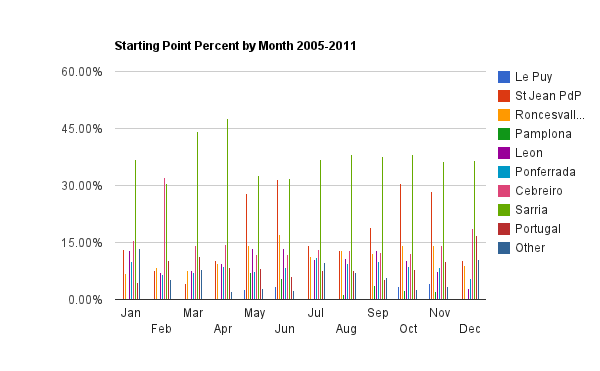 In this first chart you can see the monthly averages for pilgrims between 2005 and 2012 on each of the main camino routes. Camino del Norte -- July and August are very big months on this camino, with a higher percentage of CdN walkers in these months than for any similar months on the other routes. 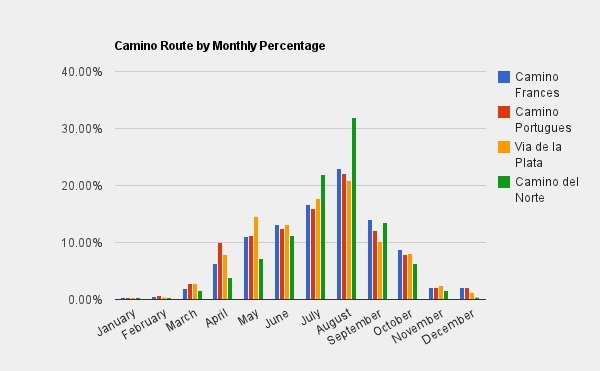 Note in the following chart how the camino has grown, particularly how the alternate routes have grown at a faster rate than the Camino Frances. It's interesting also to see the countries from which pilgrims originate. As you can see below, by far the largest contingent of pilgrims is from Spain itself. No year since 2005 has seen fewer than 47% of pilgrims from Spain. 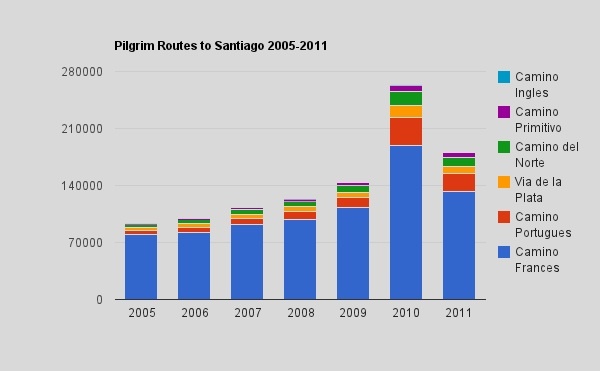 After Spaniards, it's interesting to see what countries provide the largest groupings of pilgrims. As the chart below shows, the largest grouping is actually "other," meaning small contingents from multiple countries, too numerous to identify individually in the cathedral's pilgrim stats. 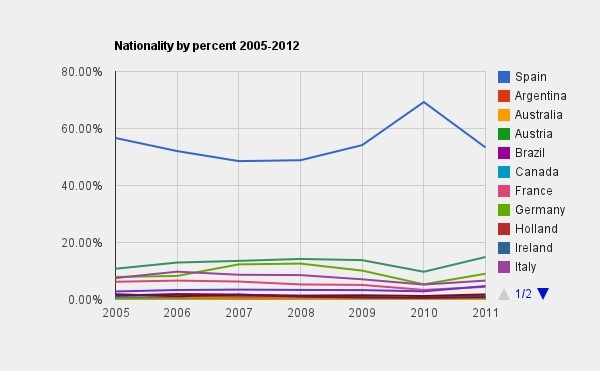 The largest individual nationalities are German, French, Italian and Portuguese. After those countries of origin there are many in a third tier, including US, UK, Canadian, Dutch, etc. It's interesting, too, to see the various starting points for the camino. As you can see in the following chart, most pilgrims start from Sarria, which of course is the minimum distance on the Camino Frances one must walk in order to receive a compostela. Other starting points are spread all throughout the Camino Frances. Finally, the month in which pilgrims begin does make a difference. Though Sarria is the largest starting point each month of the year (except February), during certain months St. Jean Pied de Port comes quite close. The chart confirms the experience of many that the camino becomes much more crowded in its last 4-5 days beginning at Sarria. BenL, El Condor 2014, hindsfeet and 2 others like this. Yes, I would be very curious of knowing that too. I, for one, am one of those. I’ve been thinking what approach I should be taking in filming my personal experiences on El Camino. One idea is also that I come up with a couple of good questions to be asked at the peregrines that I interview/encounter. A question could be just regarding the movie The Way. Getting different personal answers from different people on the same question makes it for interesting video/film editing. I like you brought that up. Let’s see what we can find out. We will begin Camino Frances in Mid-May 2013. The anticipation draws me to these forums to help plan as well as pass the time between now and our departure. We live in Alaska and although we count ourselves as adventurers...somehow we had not even heard of El Camino until we watched the movie The Way ! As the movie ended, there was no conversation of could we or should we. Simply "when" ! So, next spring it is ! I am starting the Camino Frances in September 2012 and I am mainly doing it for myself as a personal goal. It has been on my mind to do since my spanish sister in law told me all about 10 years ago. My family is also going in mid May 2013, just as soon as the college year ends for my two sons. Hope to see you on the trail! Buen Camino. Hello Wilburns! I've just recently returned from walking the Camino Frances. I hadn't heard of it until I saw the movie The Way and had that "gotta do it"! But be aware..the movie only shows the prettiest parts and many scenes aren't even shot on the actual trail. At one alburgue about a dozen of us were talking about our day and the movie, one woman asked "how many are here because they saw the movie?" 10 of us raise our hands, "how many would like to beat up Martin Sheen right now?" we all raise our hands. lol This isn't said to discourage you, just a funny observation as to how the movie portrays the trail and what it actually was. I know you'll all have a wonderful time, altho it can be challenging. As your gathering your things to take I'd recommend (strictly from my experience) sleep sack not liner or bag, plastic or very light weight fork and spoon as you'll probably have your swiss army knife, I only used my fork once as all the albergues had silverware, the only one that didn't was the municipal in Zubiri. Carolann, I think there is a large increase of Americans due to the movie. I just returned last week from walking the Camino and that was an observation many ppl made. Hi, i also heard about the Camino many years ago and has been in my mind since then, so this year i started on the Saturday 22nd September and walked for 32 days to cover the 500 miles,, fantastic walk if you let it in to your soul it will change your life, i know because i have been there,,,. and i must add never encountered the bed bugs,,,, go for it;;;. Hi there - I walked the Camino Frances June/July this year (2012) - loved it and I am eager to get back and walk from Saintiago to Muxia - the time I am considering is in January - any advice on weather conditions this time of year in Spain, would be most welcome. I am from South Africa and not used to very cold icy snow conditions - however would love the experience. I agree with you Bob, I'd never heard of the Camino till I saw the movie, and I do love the movie. We were just joking about how Martin made it seem so easy walking the Camino and we'd all had our struggles along the way. I watched the movie again a few weeks ago and it made me yearn to be back on the trail. Yeah the meeting and bonding with others is the best part. It doesn't matter where your from or your social/financial status back home out there you really are a "family" helping each other along the way. I had walked the Camino Frances four times before I went to see The Way, and like most who had walked the Way before seeing the film was thoroughly confused by Sheens journey to Roncesvalles. Part of the films "day1" seemed to include shots from the winter route, and as Bob rightly points out, Orrison seems to have done some Star Trek time shift in its location. I bought the DVD and occasionally watch it on a wet and cold evening just to remind myself what awaits in a few months time! Yeah its definitely the people that make it special. The variety of pilgrims I met was was breathtaking. You meet someone new almost every day. Sometimes that relationship can last days or weeks. Other times its just 20 minutes. But you feel enriched by each and every encounter. Susan, I want to start my Camino this Sept. a friend/neighbor said she read or heard that the Camino is paved and that I would need a warm jacket for walking the mountains. What was your experience? It's really interesting to see the statistics! I walked in August/ September 2010, starting in St. Jean Pied-de-Port. I saw the movie The Way some time after I came back, and really enjoyed looking at the landscape and recognizing where I had been. In fact, my friends refuse to watch it with me again, because I kept pointing and saying "I've been there!" and "I was there, too!" It definitely made me want to go back there! Hi-- a delayed response to "The Way." I put off watching until I had returned from walking the Camino del Norte in May 2012. So, I didn't have the experience of jumbled geography, though I live in a city where movies have frequently been filmed and it's amusing to see someone make a turn and they are suddenly on the other side of town. One thing struck me as false in the film. That was how aggressively some of them pressed Sheen for his reasons for walking. I only encountered complete respect for one's personal life on the Way. If one asked "what's your reason for walking?" the answer may have started a discussion or simply ended there. Deeper sharing came naturally after walking together for days. And, sometimes it happened immediately, but always naturally, I never felt or saw probing as in the film. The movie “The Way” inspired me as well, or I should say it made me aware of the pilgrimage Santiago. I had no knowledge of it prior to seeing the movie. I undertook the challenge of walking the Camino from St. Jean-Pied-de-Port that started on August 31[SUP]st[/SUP], 2012. But my walk has been more than a walk; it has been a personal transformation, a documented spiritual pilgrimage. I walked alone, I filmed alone; but I have not ever been alone. I’ve been working in editing the film since I got back home. In that regard, I too I’m guilty of “jumbled geography.” But there is no way around it. In filmmaking is the story line that counts, anything else is to support it, including geography. I had to succumb to that reality myself! Because of my filming efforts I had to walk alone and yet many pilgrims that I encountered on the way opened up to me spontaneously, and at times, with exquisite incites. I came home with over fifty interviews on camera from pilgrims of various nationalities. Some of these interviews became the framework for my film that hopefully will be completed and made available sometime in September. Here a list of nationalities that I encountered in my Camino: Brazil, Germany, USA, England, Ireland, Australia, Canada, Portugal, Japan, Austria, Israel, Spain, Holland, Norway, Italy, Switzerland, South Korea, France, Denmark, Czech Republic. It has been my impression that the majority of pilgrims were women. digigian, did you finished the film ? I am very interested in having a look! No, I’m not done yet. It’s taking a lot of time and money! Hopefully, it will be out in a couple of months. In any case, I will inform people through different channels, including this website. Thanks for showing interest. Same here....after I watched Martin Sheen in The Way... I felt compelled somehow that I have to do it. And after reading many more interesting experiences by other pilgrims I have decided to do it on my 65th birthday which is next year. do it at 65, whilst the body is ready and willing. Any updated info available now? Pilgrim arrivals registered at the Oficina de Peregrinos in Santiago during the month of September 2015 were 37’432. Those numbers represent an 8.6% increase compared to the arrivals in September 2014 (34’458). The year-to-date figures were 229’591 (207’974), representing a 10% increase vs. 2014. The year-to-date percentage increases compared to 2014 of pilgrims who walked the various Caminos are: Francés 6%, Primitivo +39%, Inglés +29%, Portugués +21%, Norte +11%, VdlP +7%. The y-t-d proportions of people walking these Caminos were: 65% Francés, 17% Portugués, 6% del Norte, 4% Primitivo, 4% Inglés, 4% Via de la Plata, and 1% the remainder. 24’610 Pilgrims walked the Camino Francés during September (65.7% of all arrivals), 941 more than those during the same month in 2014. 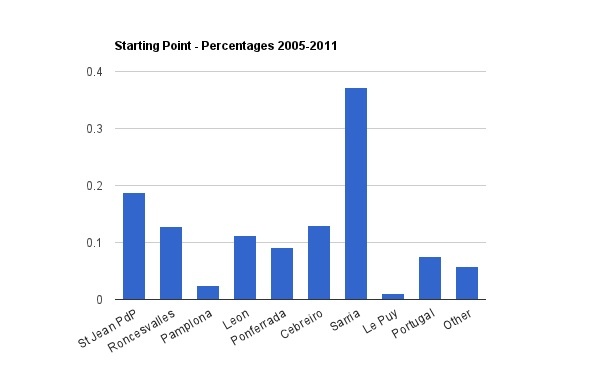 However, the overall percentage of Camino Francés pilgrims who started from Sarria keeps steadily increasing: 40% this year, 37% in 2014, 35% in 2013, 31% in 2012, etc. There is a similar trend of starters from other towns within the “100 km Compostela requirement” such as Tui +20% and Lugo 41% amongst others. Strangely enough no changes could be noted from Ourense. Looking ahead: from October to December, and if this year’s trends continue, some 33’000 pilgrim arrivals could be expected. The pilgrims who started in SJPP will outnumber those from O’Cebreiro and Sarria and make up the bulk of arrivals in November. RE: Pilgrims' home country -- I walked the Portuguese Camino starting in Tui, Spain on September 28th. And while I was not the only person from the U.S.A. (I walked with my good friend from California) - Germany, So. Africa and Spain were the most represented countries at the Portela Hostel. RE: my reason --- I am still sorting through pictures, journal, and soul to put into words the experience of walking my 1st Camino. I did not start out with some weighty religious or personal problem to work out - in fact, I began the trip (day 1) with my usual confidence that this would be just another experience to file away in life's experience-bank. I could not have been more wrong. That first day, between Tui and Porrino - walking through the industrial area of town in 86 degrees (f) with trucks whipping by, diesel exhaust, and the sounds and smells of all the manufacturing plants, I asked myself "what the hell have I gotten myself into?" Not long after the question we came upon a young man - late 20's maybe - on two crutches, ankle and knee wrapped moving so slow that we quickly overtake him. And it was an agonizing minute that we walked along side of him before he smiled and said "poco a poco" - which we took to mean "little by little" or step by step. That was the first and last time I questioned my desire to walk the Camino. We stopped to eat and then - later came upon the same young man who, we learned, was from Venezuela, sitting against a fence with a white towel over his head and neck to protect against the sun as his crutches leaned precariously against the chain link. We asked if he needed water, food etc. Venezuela thanked us but said "no" - exposing a calm demeanor and determination as he told us his story. We leapfrogged with Venezuela for most of the trip - coming across him conversing fluently in Cafe bars and other places. And, after two days in Santiago, who do we see in line (waiting to get his credential) as we are walking from the cathedral to our hotel in the late afternoon? Venezuela! Somehow - his success meant so much to us as we congratulated him and traded experiences. I'm coming to believe that the Camino - any Camino - is magical. And while the lessons I learned did not gel immediately upon my return home I await the daily epiphanies that come from the very human and beautiful memories of my first Camino.